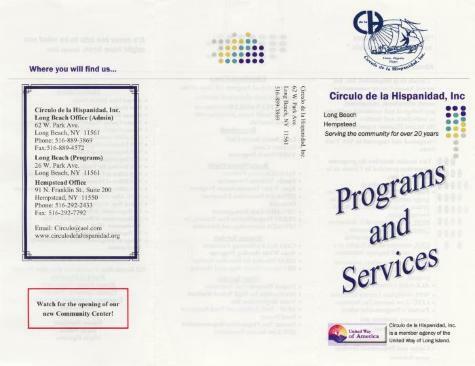 Círculo de la Hispanidad, Inc. brochure, describing programs and services offered by the nonprofit organization, Suffolk and Nassau Counties, N.Y., n.d.;Círculo de la Hispanidad, Inc., a community-based Long Island organization incorporated in 1980, provides a wide spectrum of programs and services to the Hempstead and Long Beach communities, from education programs, numerous health services, HIV/AIDS education and services, crisis intervention, child care and housing, to cultural enrichment. Source: Hofstra University. Hispanic/Latino Collection, 1951-2008. Box 24, Folder 2.